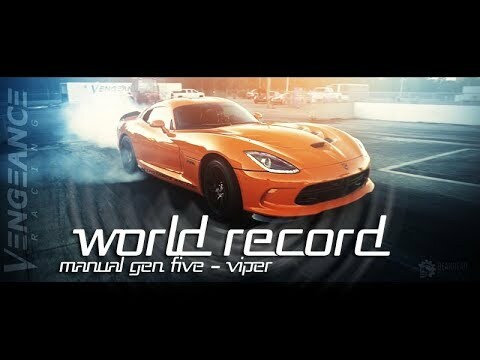 On July 21, 2017, this twin-turbo manual Gen 5 SRT Viper set a new world record by running a fourth of a mile in just 9.28 seconds. But before this, it was also the Gen 5 Viper that held the record for the fastest 6-speed manual transmission in just 9.35 seconds at 157 miles per hour (252 kilometers per hour). When it went through the Carolina Dragway, this race focused model was able to cover the distance in just three passes, and it took only 2.28 seconds at 162 miles per hour (260 kilometers per hour). Big thanks to the tuner for the twin-turbo forged V10 setup that made it possible to beat the record. This, along with the OEM wheels with Nitto 19” drag radials of course. This setup enabled the car to carry out 1,061 RWHP and 1,000 RWTQ. That’s not the car’s limit though according to the tuner, as it can reach up to a maximum of 178 miles per hour (286 kilometers per hour) when covering greater distances, perhaps half a mile. The twin-turbo system is very impressive, as it can produce no less than 1,500 RWHP on its own. Apart from a jaw-dropping performance and beating records, this Gen 5 SRT Viper has an engine that roars louder than you might have expected. Do not expect it to be the loudest one out there, but it will definitely turn heads. In other news, the very last Dodge Viper has rolled off the production line last week. Ralph Gilles, FCA design boss, has been in charge of the FCA’s styling since 2015. And recently, he posted a photo of the bright red Viper with a caption “so long” which is his way of announcing that it will be the final model. The model in the photo will be kept by the FCA as part of the company’s collection, while the second to the last model that is finished in bright yellow with black accents will be going to Gilles’ friend, which he himself announced. Fans of the Dodge Viper were quite sad after hearing the news, but Gilles stayed optimistic and instead focused on the legacy and the memories of the company’s V10 monster. In his interview regarding the Viper, he said that it sold well in the past few years, and that its sales record is not the issue for the model’s retirement. Rather, it is the new ejection mitigation regulation airbag that does not fit in their package. The Gen 5 had a great 5-year run with this platform.